The mean age of tobacco use too has increased from 17.9 years in 2009 - 2010 to 18.9 years in 2016-2017. Tobacco consumption in India has decreased by 6 percent among the adult population. As per the latest GATS 2 (Global Adult Tobacco Survey), tobacco consumption among adults aged 15 and above has come down from 34.6 percent in 2009-2010 (GATS1) to 28.6 percent (266.8 million) in 2016-2017. There is also a decrease in smokers from 14.4 percent to 10.7 percent and smokeless tobacco use from 25.9 percent to 21.4 percent between the same periods. The mean age of tobacco use too has increased from 17.9 years in 2009 - 2010 to 18.9 years in 2016-2017. The survey covering 30 states and UT’s of Chandigarh and Puducherry, commissioned by the Center for Disease Control and Prevention, USA was released at the National Conference on Tobacco or Health organized by Salaam Bombay Foundation, Tata Memorial Hospital, Action Council against Tobacco and Healis- Seksaria Institute for Public Health. As per the findings 19 percent men, 2 percent women and 10.7 percent (99.5 million) of all adults in India currently smoke tobacco out of which 4 percent smoke cigarettes and 7.7 percent smoke bidi. Approximately 27 percent men, 12.8 percent women and 21.4 percent (199.4 million) of all adults currently use smokeless tobacco and 42.4 percent of men, 14.2 percent of women and 28.6 percent (266.8 million) of all adults currently use smoked and/or smokeless tobacco). In terms of frequency, 24.9 percent (232.4 million) adults are daily tobacco users and 3.7 percent (34.4 million) are occasional users. Further, 38.7 percent of adults were exposed to second hand smoke at home, 30.2 percent adults who work indoors are exposed to second hand smoke at their workplace and 3.4 percent adults were exposed to second hand smoke at restaurants.The average monthly expenditure on cigarette has gone up from Rs 668 to Rs 1192.5 between 2009- 2017 and Rs 156.3 to Rs 284.1 for bidi during the same period. Tobacco use is highest in the northeastern states - Mizoram has the highest tobacco smokers at 34.4 percent followed by Meghalaya at 31.6 percent and Tripura at 27.7 percent. In terms of smokeless tobacco the percentage is highest in Tripura at 48.5 percent followed by 47.7 percent in Manipur and 42.9 percent in Odisha. Tripura has highest no of smoking and smokeless tobacco consumption at 64.5 percent followed by Mizoram at 58.7 percent and Manipur at 55.1 percent. Maharashtra is the only state to see a significant decrease in smoking by 2.8 percentage points and smokeless tobacco use by 3.2 percentage points. Around 6 percent men, 1.4 percent women and 3.8 percent of all adults currently smoke tobacco. Approximately 32 percent men, 16.6 percent women and 24.4 percent of all adults currently use smokeless tobacco while 35.5 percent men, 17 percent women and 26.6 percent of all adults either smoke tobacco and/or use smokeless tobacco. In terms of the types of tobacco consumption in the state, there is a decrease of 4.8 percentage points of any tobacco use from 31.4 percent in GATS 1 to 26.6 percent in GATS 2. Khiani and gutkha are the two most commonly used tobacco products. 15.5 percent adults use khaini and 8.6 percent adults use gutkha. About 5 percent use oral tobacco application, 3.7percent have betel quid with tobacco and 1.95 smoke bidi. There is a decrease of initiation of mean age from 18.5 years to 17.4 years between 2009-2017 however the prevalence of tobacco use among persons aged 15-17 years however has increased from 2.9 percent to 5.5 percent . “There are 3500 deaths daily (13.5 lakh annually) due to tobacco consumption in India. Tobacco generates Rs 17000 crores annual revenue. Every third tobacco user dies prematurely. With the implementation of Juvenile Justice Act India is the only country in the world to change tobacco control where anyone who gives or causes to give tobacco to a child less than 18 years of age is punishable by 7 years rigorous imprisonment and Rs 1 lakh fine. 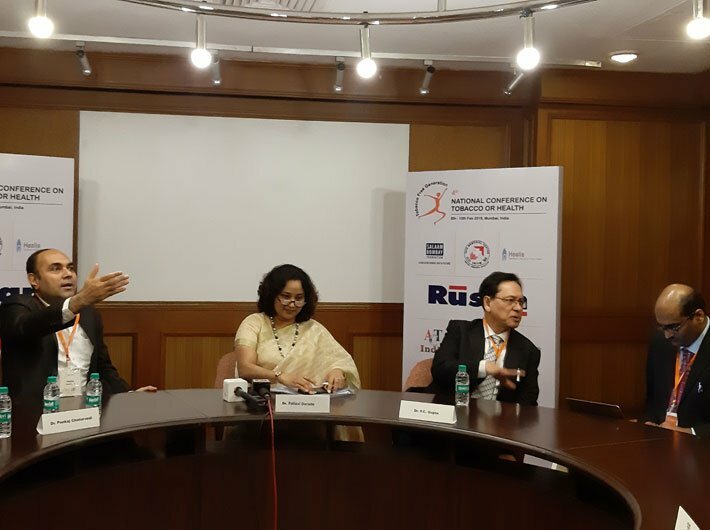 Now it is on us to ensure that this is enforced’ said Dr Pankaj Chaturvedi, Dr Pankaj Chaturvedi, Deputy Director,Centre for Cancer Epidemology, Tata Memorial Hospital . Vineet Gill of WHO India said that as per WHO FCTC (Framework of Convention on Tobacco Control) findings Govt of India is spending Rs 100,000 crore on treating tobacco related diseases annually .This amount exceeds its expenditure on health as its revenue collected is 17 percent of this expenditure. State commissioner, food and drug administration, Pallavi Darade said that in 2012, Maharashtra was the first state not only to ban pan masala and gutkha but also scented tobacco, supari and kharra. There is a continued notification in January 2018 - Maharashtra is the first state to pass a notification to ban tobacco and FMCG products from the same premises. “The idea behind the ban is to prevent children who come to buy chocolates and other products from being addicted. Due to porous borders there is a free flow of banned products from neighboring states. Since 2012 we have seized more than 176 crores of gutkha and lodged more than 4000 FIR’s all over Maharashtra. We have taken out a circular and approached the transport commissioner to confiscate these banned products and cancel licenses of vehicles and drivers carrying them with action under the Food Safety Act and CrPC.” she said.